Donald Trump said it was a “tough night” for Marco Rubio on Tuesday, before turning his attention to Hillary Clinton. He also said Clinton had committed “a criminal act” without going into detail. “If she’s allowed to run I would be very, very surprised. If she’s allowed to run, honestly, it will be a sad day for this country. Because what she did was wrong,” Trump said of Clinton. While other candidates hold rallies and victory speeches, Trump celebrated his successful Super Tuesday with a White House-style news conference at his massive Mar-a-Lago estate in West Palm Beach, Florida. Trump pledged that he’s going to go after Hillary Clinton, “assuming” she’s allowed to run. Rival Ted Cruz quickly used those words against him, saying Trump supported Planned Parenthood, in a bid to win over conservatives. Trump also said he watched CNN, MSNBC and Fox News on his TV throughout the night — and joked that by watching all three networks he was “becoming diplomatic.” He even congratulated Ted Cruz for winning his home state of Texas. When questioned about if he could get along with House Speaker Paul Ryan, Trump said Ryan would pay a “big price” if they don’t. 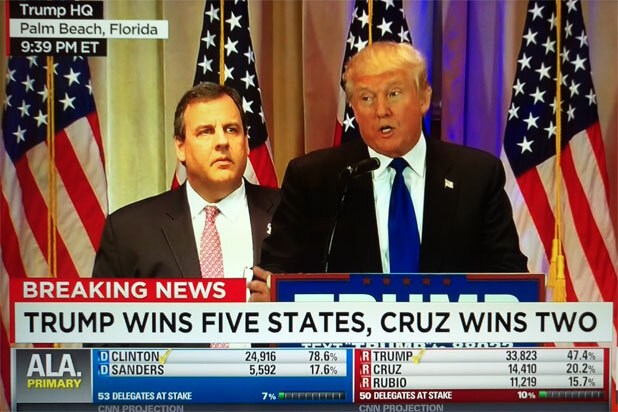 Super Tuesday, The Culling: Trump and Clinton Gain, But Who Else Survived?